B.S. (before sickness), I had devoured two baking books: Ovenly by Erin Patinkin and Agatha Kulaga and Huckelberry by Zoe Nathan. I baked quite a bit from each, admiring both equally for their creative flavors and make ahead ease. 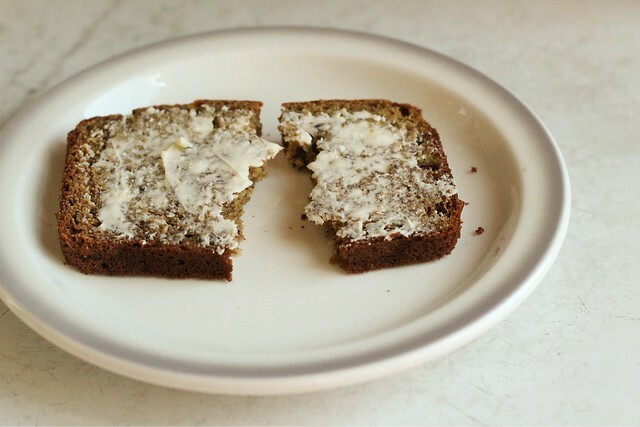 I can't quite get over the Ovenly adaptation of Mollie Katzen's whole wheat banana bread, which I in turn adapted further and have been making weekly. My boys like it so well I haven't been able to branch out from banana, but I would really like to try it with pineapple puree that's been well drained. The fruit and maple syrup make it plenty sweet, so I cut out the sugar all together and no one's the wiser. And of course, extra virgin olive oil is standing in nicely for the recommended flavorless oil. Preheat oven to 350 with rack in the center. Grease a 10x4 (or 9x5) loaf pan with butter and set aside. In a medium bowl, whisk the flours, flaxseed meal, baking powder, baking soda, and salt together and set aside. In a large bowl, whisk the maple syrup with the eggs, olive oil, and vanilla until well blended. Add the yogurt and mashed banana and whisk until nearly smooth. Fold the dry ingredients into the wet, taking care not to over mix. Pour into the prepared pan and bake for 50-55 minutes until a tester comes out clean. Cool in the pan for 5 minutes before removing the loaf to a wire rack to cool completely. Try to resist slicing it until it has cooled at least 1 hour. I'm pretty sure the best way to eat this is with a good amount of butter, and it's your call if you would like to toast it first. If you forgot to buy salted butter like I did last time I was shopping, just sprinkle the top with a little flaky salt. 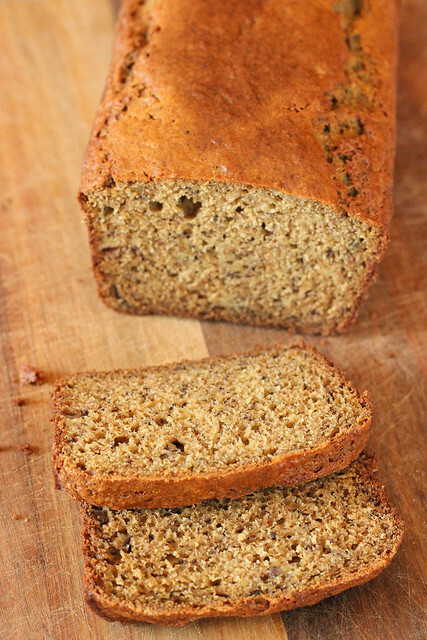 This bread ages very well, the wheat flavor deepening and the flax becoming more nutty tasting the next day. Stored at room temperature, you can easily keep it for 4 days or so - it would likely fare longer if stored in the refrigerator. You could easily add nuts, but I like the soft texture without them for a change of pace. We had one warm week last month, enough of a breath to carry us through the early part of spring that seems perpetually cool and damp. It's good quick bread weather for a while yet and I don't mind. Once the world heats up, I don't have the craving for fast bakery like I do just now. Then I like to let the warmer weather work its magic on the wild yeast and daydream of baking outdoors in an earth oven. Meanwhile we're keeping an eye on the daffodils and magnolia trees, eagerly anticipating the first of the chives which miraculously seem to have grown overnight due to the rain. Sometimes it's easy to wish away this type of weather, but all too soon summer will arrive and I'll wish for these cool, dreary days! Better make some more coffee, slice some bread, and enjoy it while I can.